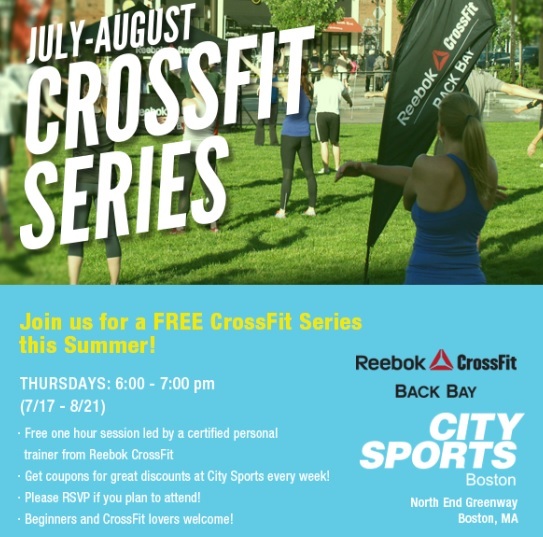 Free CrossFit in the North End this Summer from City Sports! On Thursdays this summer, City Sports is offering free CrossFit on the North End Greenway this summer from 6-7pm until Thursday, August 21, 2014. These CrossFit classes are free but please RSVP at least one hour before the event. For more information or to RSVP, please head here. If you are looking for more free fitness classes and events in Boston this summer, don’t forget to check out this free fitness post or check out the free fitness category on the blog!